Please Email me to place an order or to ask any questions. 50% non-refundable deposit required, 50%+shipping due upon completion. Parts remain for some dicontinued items as indicated (avail. column), though I'm not actively assembling them. Ask nicely and I'll probably oblige any request should PCBs remain. Voltage Controlled Transistor Gates. Mostly discrete and very vintage in character. Gate A is normalled to Gate B, so that one can connect an envelope to Gate A CV input and use Gate B as a level control. In addition both gates are sent to a summing stage, and Gate A output signal is inverted before summing. A variety of old and original spec components used where possible here. Balanced modulation of the vintage variety. Special care given in using part types accurate to the original 200 series. Fully modulated sound is available at the ring output. The variable output allows continuous control of modulation amount as determined by pot settings and external CV. DISCONTINUED. 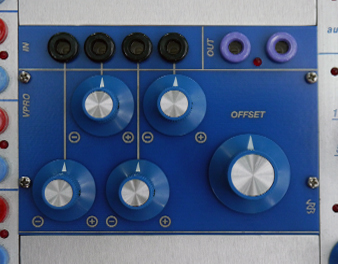 Spring reverb simulation, with voltage controlled crossfader with offset (amount) pot and inverting processor pot for CV input. Mono output. New C revision has improved signal levels. Constant fully reverberated sound is available at the top output. The lower output (variable) is modulated between wet and dry reverb mix determined by pot settings and external CV. DISCONTINUED. Baxandall type EQ as found in the old designs with an additional voltage controlled crossfader. The buffered input signal and EQ are inverted, and as such one can set the offset at the cancellation point and use the crossfader as a crude VCA. DISCONTINUED. Self-centering thumbstick with Z-axis passive switch. All four directions available as outputs, two of which are a shorting bar's distance from one pole of the switch connection. This allows for selective joystick operation - i.e. only when you click it down does the voltage change at the other end of the switch contact. 10V range - shorting bar included. DISCONTINUED. Dual speakers capable of monitoring audio signals or reproducing program channels at low levels. Normalized connection allows mono input to drive both speakers. Approximately 3 Watts total output. DISCONTINUED. Voltage processor. 4 bipolar input processors and a manual offset control. Some day there might be a new version of this with additional features. Otherwise: DISCONTINUED. Panner/Crossfader. Switch selection of 1:2 or 2:1 configuration. LEDs indicate vactrol activity (and thus, input or output levels depending on switch selection). Offset pot allows for manual control or increased threshold. 1:2/2:1 was too strange a designator, hence the abbreviation to 12:21. DISCONTINUED. Voltage controlled bandpass filter. The timeless classic x.5 in a two space modulemodule format. Care given to original spec parts wherever possible - all metal can ICs and transistors (including the original JFET pair) used, filter caps, etc. DISCONTINUED.